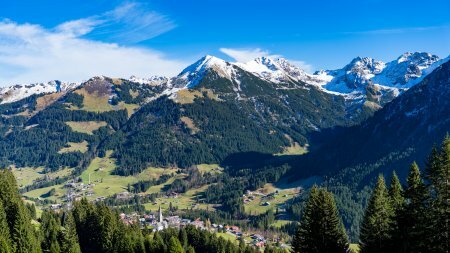 Explore Oberstdorf in the Allgäu with Alpenflair! We are happy to welcome you to our beautiful oberstdorf in the alps of the allgäu and in one of our up to five stars classified apartments. We offer luxury apartments and holiday houses in different price classes. The apartments are well located in the center and quiet surroundings in Oberstdorf and all facilities are included. You can reach the following within a few minutes of walking: Oberstdorf center skating rink sauna and pool hiking trails cross-country skiing trackes ski schools etc. Comfortably by bus you can reach all cable cars in Oberstdorf and Kleinwalsertal, as well as many attractions in the surroundings. Oberstdorf is known as a health region – next to many sport activities in winter as well as in summer you can simply relax and enjoy nice views including fresh air. From May to November you can use all cablecars in Oberstdorf and Kleinwalsertal for free as often you want ( depending on opening hours). These are: Nebelhorn, Fellhorn, Kanzelwand, Walmendinger Horn, Söllereck, Ifen, Zaferna-Sessellift and Heubergarena. You can book your green fee on site at our beautiful 9-hole golf course in a fantastic mountain setting with a reduction of 30% as often as you like, for both 9 holes and 18 holes. 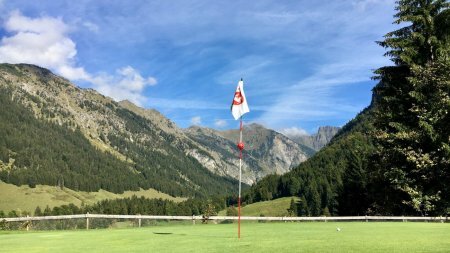 Get a taste of the golfing experience in Oberstdorf here!